Among the ninety-eight Americans murdered by the Japanese on Wake Island in 1943 was the civilian doctor, Lawton Shank, who had provided and coordinated vital medical services during the siege and battle of Wake in December 1941. Numerous sources attest to Dr. Shank’s continuing medical services through the difficult transition to captivity on Wake and, after the majority of prisoners were shipped out in January 1942, for the nearly four hundred Americans who remained on Wake for nine more months. 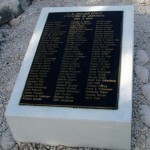 When the last 265 prisoners to leave Wake Island alive were removed in September 1942, Dr. Shank volunteered to stay behind on Wake with the remaining prisoners. Shank’s medical skills and stalwart dedication to the welfare of civilians and military personnel went above and beyond his job description and call of duty. After the war, Lawton Shank was awarded the Navy Cross posthumously, the only American civilian recipient, then and now, of this high award. Lawton Ely Shank, born April 29, 1907, in Angola, Indiana, was the first of three children of H. Lyle and Lulu E. Shank. Lawton married Ruby R. Ricker in 1936. Ruby, a surgical nurse, remained in Indiana when Dr. Shank went to work for Pan American Airways in the Pacific in 1940. Records show that he sailed for Honolulu on the SS Lurline in July 1940 and then went on to Canton via Pan American Clipper. 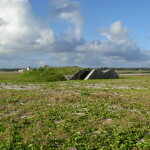 In early 1941, Dr. Shank was assigned to Pan American’s Wake Island station. My grandfather’s letters from Wake mention his lively philosophical discussions with the doctor during evenings in the Pan Am lounge. While Dr. Shank’s chief responsibility was to Wake’s Pan American employees and passengers, he also provided medical care for the navy contractors until the arrival of their physician Thomas Barrett in March 1941. 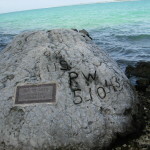 Shank left for the mainland in July 1941, though records do not show if it was a resignation, reassignment, or vacation. By the fall of 1941, the CPNAB operation had grown to over a thousand civilian workers on Wake. Doctor Barrett, several male nurses, and dentist James Cunha, worked steadily to treat everything from sunburn to burst appendix. Records confirm that CPNAB hired Dr. Lawton Shank (USNR) that fall and he returned to Wake by Clipper on October 12, 1941, as a physician for the contractors. The U.S. Navy assigned Lt. (j.g.) G. Mason Kahn to Wake in November to serve as physician for the swelling military contingent on Wake. On December 4, 1941, Dr. Barrett departed Wake, leaving Dr. Shank as the only civilian medical doctor when war came four days later. A second reinforced concrete bunker (ammunition magazine) became Dr. Kahn’s military hospital and Commander Cunningham and Major James Devereux used two others in the row for their command posts throughout the siege and battle. Many survivors’ accounts praise Dr. Shank’s skill and dedication during the difficult and demanding days of the siege. Following surrender, the American doctors were denied access to supplies as the wounded lay on the open ground and dysentery swept through the exhausted survivors. Conditions improved when the Japanese moved their captives into the partially destroyed barracks, but the Japanese had no drugs or supplies to spare for the American doctors, a condition that did not markedly improve even after the majority of prisoners were removed in January. When the last contingent of prisoners departed Wake in September 1942, physician Lawton Shank, dentist James Cunha, and surgical nurse Henry Dreyer remained, three of the ninety-eight from whom nothing would ever be heard again. The President of the United States of America takes pride in presenting the Navy Cross (Posthumously) to Dr. Lawton E. Shank (U.S. Army Reserve), a United States Civilian, for extraordinary heroism in action against the enemy as Physician to American Contractors, Naval Air Station, Wake Island, while associated with the naval defenses on Wake Island on 9 December 1941. At about 1100, while in the camp hospital, during an intensive bombing and strafing attack in the course of which the hospital was completely destroyed and several persons therein killed or wounded, Doctor Shank remained at his post and supervised the evacuation of the patients and equipment. With absolute disregard for his own safety, and displaying great presence of mind, he was thus enabled to save those still living and to establish a new hospital in an empty magazine. Doctor Shank’s display of outstanding courage and devotion to duty were in keeping with the highest traditions of the United States Naval Service. The Joint POW-MIA Accounting Command mission to identify remains recovered on Wake Island in 2011 continues to seek families of the Wake 98, including the family of Dr. Shank, for DNA sampling.